Two months ago I embarked on a new lifestyle diet in order to curb a downward spiral of mental health and stress-related physical pain. I stumbled upon Dr. Perlmutter’s Grain Brain, which provides a comprehensive exploration into the body’s inflammation response and how certain foods, namely grains and sugar, contribute to this inflammation. Tying this inflammation to the brain focused on research with Alzheimer’s and dementia patients, but Dr. Perlmutter relates these processes to other mental health issues as well, such as depression and anxiety. With this new understanding of what might be at play in my body, both with my brain and the digestive & joint pain I was experiencing, I decided to embark on this new lifestyle diet. The basic tenets are a diet high in good fats & protein, low carbs coming from mostly vegetables, very little fruit, and no grains, legumes or sugar. It’s certainly not a diet for everyone and I have my struggles with it, but I have seen an incredible change just in these last two months and that is enough to keep me going with it. Where I have struggled the most is finding my groove with this new lifestyle diet while staying in touch with my food politics/ethics. Food choices are complex and it’s hard to reduce our choices down to simple buzzwords such as local, organic, natural, humane, sustainable, etc., particularly if diets can restrict those choices even further. Choices end up becoming a fine dance between the best and the worst options for the environment, animals, people, and society. And let’s be honest, sometimes the wallet can be a very real deciding factor as well. Despite working on a vegetable farm I don’t eat a wide variety of vegetables. As I’m sure a lot of people can relate to, I have a hard time fitting cooking into my busy schedule. Over the past few years I have gotten myself into a food rut that relied heavily on grains and what I call staple vegetables – romaine lettuce for salads, potatoes & carrots for dinner, broccoli & celery vegetable trays. While working here at Pfenning’s there is one thing I have learned…importing vegetables from California is expensive. There are many factors that contribute to this – a long-lasting drought (a.k.a. climate change?) and a terrible exchange rate to name just a few. We have been working hard at increasing our own organic acreage and yields, as well as working closely with Ontario organic growers to get their produce to market, so we can rely less on imports from more precarious markets. The drive for local food has been a response to these increased food costs. As I look for more ways to incorporate vegetables into my diet I’m looking directly at substitutions for those staple products I used to rely heavily on all year round. Seasonal eating has it’s benefits, often less expensive and fresher quality. Broccoli is something I could eat every day, it’s my favourite vegetable as my picture on our contact page can attest. The problem is, it’s out of season now, and from what I hear from our purchasing department, it’s exorbitantly expensive coming from California. 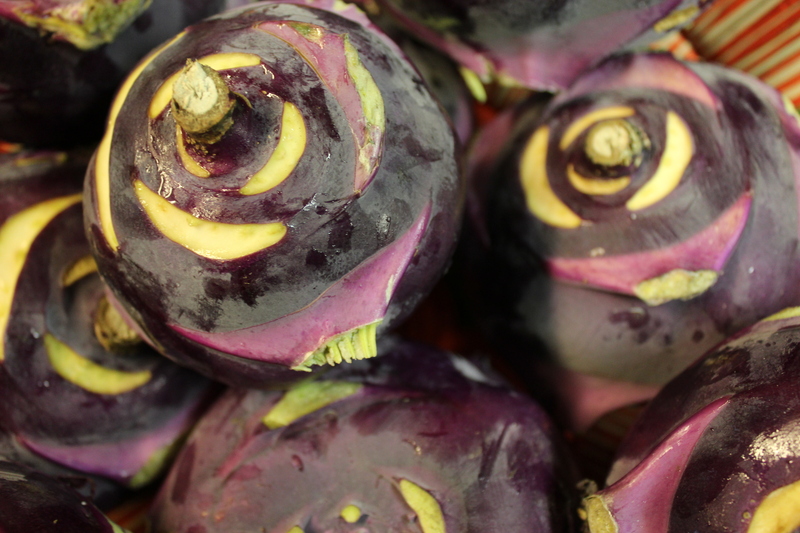 So this past week, while grocery shopping in our warehouse, I needed something new…Celia, on our sales team, suggested I try the Kohlrabi that has come in from some of our Ontario growers – still in season! In the spirit of my changing dietary habits I took it home and decided to try it as a substitution in one of my newest favourite dishes – Coconut Curry Stir Fry. Stir fries are some of the easiest types of dishes to cook with a busy schedule! Quickly cut up some meat and veggies, throw it into a wok to fry it, add a generous amount of sauce and you are good to go! This delicious Coconut Curry Stir Fry recipe comes from PaleoLeap’s blog post “Quick and Easy Paleo Stir-Fries”. It incorporates the good fats from coconut oil (used for the frying) and coconut milk, with protein from chicken and generous helpings of vegetables, making this dish low carb, very satiating and exactly what I need to eat with my new diet. This recipe calls for broccoli, but I substituted with local organic kohlrabi by peeling the outer skin and cutting it in lengths much like the broccoli stalk. Kohlrabi ended up being surprisingly delicious in this dish and added a crunch that was really appealing. I have now gone to shredding the rest of the kohlrabi I bought into this week’s salads, along with local organic carrots and hard-boiled local organic eggs. For other ways to enjoy kohlrabi, check out these tips from The Kitchn. As we move into the winter season our local options dwindle to storage crops, but these end up being perfect for soups and stews! I’m really looking forward to those on the cold winter nights ahead. But for the next couple of weeks I’ll continue to enjoy the refreshing crunch of local kohlrabi!